The Louisiana Bill of Sale Forms are legal documents that provide information with regard to the sale and purchase of any form of new or used property. These documents will also provide proof of change of ownership. Some of the forms will require the presence of a notary public. 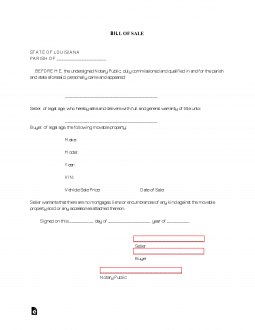 For those forms, it is advised that no signatures be submitted until the notary public is present. Boat Bill of Sale – This document will provide proof of purchase and change of ownership of a vessel/boat. General Bill of Sale – Will be used, usually, by two private parties, to prove legal sale and purchase of personal property. Gun Bill of Sale – This form would be used between dealer and individual or two private parties to prove legal sale and purchase, as well, the date of the change of ownership of a firearm. Vehicle Bill of Sale – To be used to prove the legal sale and purchase of a motor vehicle. This form will generally be necessary for registration in the state.